My journey from one to five-star camping started in 1986. My husband and I shared an old-fashioned canvas tent with friends. One of them snored, and we had hardly any equipment apart from the tent and sleeping bags. We could have done with cooking equipment and ear-plugs. Lesson learned: like scouts, be prepared. One star. In 1988 we emigrated to Australia and wanted to go exploring. We camped with relatives in a borrowed canvas tent. It leaked. After that we decided to stay away from canvas and my husband rigged up a false floor in our Liteace van. Simple: mattress on top and storage underneath. This, although cramped, was dry and a step up from sleeping on the ground. Two stars. In 1990 we started to grow our own small humans and as the van was built for two, it was no longer practical. We stopped camping for a few years, then got a second-hand Koala Camper Trailer. This lasted us several years. We covered it with tarps to protect the canvas from rain and provide an undercover living area. As our children grew up, they graduated to erecting their own small dome tents under the tarps. They were so much easier to put up than the canvas tents. With three overlapping tarps to cover everything it was an ace set up. Over time the list of essentials grew, including a bar fridge and a portable TV. This configuration evolved from three to four-star camping. One star deducted for lengthy set-up and pack down times. During the 'naughties' my husband had a brief dalliance with the idea of renovating a decrepit old caravan, the hideous thing sat in our garden with its insides gutted for a couple of years before we gave it away. More time passed, our children became adults, and we decided to have some weekends away as a couple. The trailer tent was too big, and putting up tarps in case of rain was too tiresome for short stays. My very clever husband built a Teardrop Camper. It's got everything we need in it and is easily towed by a small car. We pop an Event 14 gazebo over the top for an undercover area if it's needed. Advances in Technology have given us a plug-in that can turn our laptop into a TV, and a stick that gives us mobile Internet. 'Roughing it' now means taking an Esky instead of a fridge. Delicate flower that I am, this set up makes me a happy camper. I give it five stars. 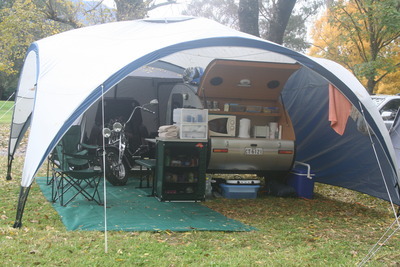 Our set up at Tawonga 2011 - Teardrop, Event 14 and BCF lean-to tent. Whether you want a few weekends in the outback with your 4WD and lean-to tent, or you plan to cycle around Australia with a swag, there's something out there to suit your needs. The more you do it, the better you'll get at it. It took me nearly 25 years to get to five-star camping, but if you want to do 'proper camping,' bathing in rivers and digging your own toilet, then that's fine. If you can't survive without your hair straightener, that's fine too. Personally I think it makes no difference whether your hair is straight or frizzy when marvelling at the milky way on your way back from the toilet block. In camping there is room for everyone: except Winnebagos and converted coaches. And I mean that literally. Often they have to book ahead as most sites are too small. The only thing funnier than watching someone trying to back a huge vehicle into an awkwardly small site, is watching someone put up a tent for the first time. I highly recommend having a practice run in your garden first. Make it the front garden if you like to entertain your neighbours. Why? There's nothing like living outdoors to make you appreciate home. When: Anytime. Book well in advance for Easter. Where: Anywhere. We like Big4 Parks. Cost: Ranges from free to $40ish a night with power, water and en-suite toilet. Wow this sounds do-able. Think we will give it a try. Loved this article. I can totally relate. Every year we add something to make our camping trip more comfortable. Still camping in a tent we aspire to owning a camping trailer. Thank you Ginar and Debra. I know some people scoff and say what we do these days is not 'proper' camping, but we love our set up. Husband has just bought an induction cooktop for the Teardrop, and they look at us and say "are you serious?" Hah! Yes we are, almost every site we go to is powered, so why not? Debra, our camper trailer served us well for many years, until we down-sized to camping for two. Ours was very basic but you can get them with all sorts built in these days. Thank you Anna.76. We have sold this Teardrop and built another one since I wrote this article. The one we have now is five-foot wide instead of four-foot wide. That's the size of a queen size mattress. An excellent article. I can soooooo relate to it.